Bajiao Huiqing (Basho Esei, b. 880? ), 13th Generation. Line: Mazu (8th Gen.) to Baizhang to Guishan to Yangshan to Nanta to Bajiao. 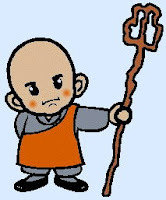 Master Bajiao said to the assembly, "If you have a staff, I will give it to you. If you have no staff, I will take it away from you!" Having it support us, we wade across a river that has no bridge. Having it accompany us, we return to the village on a moonless night. But if you call it a staff, you will go to hell as swiftly as an arrow. Everywhere it enhances the spirit of our sect. This Bajiao said: Facing south and seeing the big dipper. And lack itself is taken away. Facing your computer, see the staff.